RNspeak Is Now Open For Nurse-Writers! Home RNspeak Is Now Open For Nurse-Writers! Are you a nurse? Do you have a natural flair and passion for writing? Do you want to hone your writing skills and improve your nursing knowledge at the same time? Do you want to earn while doing what you love? If you say “YES” to all of these questions, then you’re the one that RNspeak is looking for! 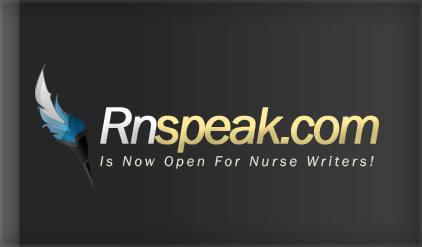 RNspeak is now opening its doors for all nurses who want to take their writing hobby to a higher notch. Regardless of experience, specialty or clinical background, every nurse has something to say. And with over a thousand of nurses joining its growing online community, RNspeak is a great place to connect, inspire and share valuable medical/nursing information for every nurses and future nurses of the world. RNspeak.com is a website established by group of registered nurses to serve as an online repository of up-to-date and valuable nursing information. From nursing care plans, drug studies, medical disorders, nursing trivia, employment opportunities up to the hottest nursing news updates, RNspeak.com aims to unite and inform nursing community through articles written by nurses who are purely dedicated in helping other nurses and educating the public about the latest health/nursing trends. Blogging has changed how we get information over the years and with RNspeak.com slowly establishing its place within the online community, every nurse has now a platform to “speak” what’s on their mind and share it to all nurses across the world. Applicant must be a NURSE. We prefer candidates with at least 6 months of clinical experience in any nursing field. However, students, nursing graduates and registered nurses are also free to apply. Applicant must be able to write readable articles in English language. Competent knowledge about English grammar, punctuation and spelling is required. Applicant must be willing to submit at least four articles per week. Payment is on a per-article basis and topics will be assigned by the website administrator beforehand. Must have a working bank account to receive payment for each article done. Writers will receive payment once every end of the month. Applicant must be able to write at least 1,500 to 2,800-word article that is original and not copied/spun. Once you submit an article for review, you must certify that all the contents are original and not plagiarized/copied from other sources. Applicant must be able to submit entries in article format. Letter or poems will not be allowed unless they’re a part of a nursing article. Applicant must have the passion for both Nursing and Writing. This is a wonderful opportunity for qualified nurses so make sure you won’t miss this out!